1 Slice the aubergines and sprinkle with salt to draw out some of the water. Rinse and pat dry. 2 Heat plenty of oil in a frying pan and fry the aubergine slices on both sides until golden brown. Season with pepper and keep warm in the oven preheated to its lowest temperature. 3 Season the fish with salt and pepper and sprinkle with a little lemon juice. Heat 1 tbsp oil and cook the fish on both sides over a gentle heat. 4 Add the horseradish cream and cream cheese and puree finely. Season with salt and pepper and add lemon juice to taste. 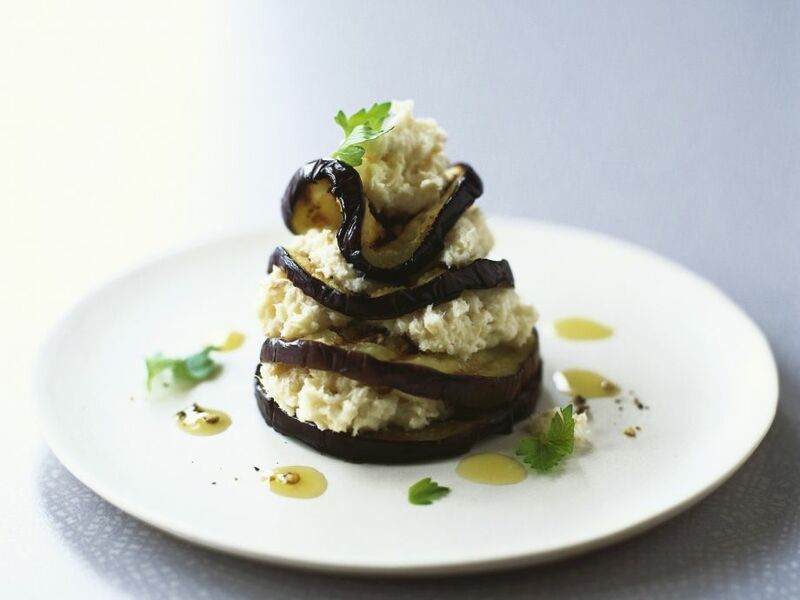 5 Now assemble 4 aubergine 'towers', alternating slices of aubergine with haddock puree. Serve garnished with parsley and sprinkled with freshly ground pepper. Decorate the plates with olive oil.